Holiday in detail - Angel Holidays. 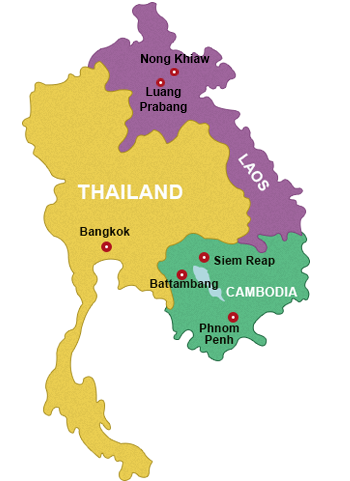 :: Laos,Bangkok and Cambodia ::. Your international flight to Bangkok is NOT included but can be booked from around £390. You can also arrive earlier or stay on later, please see our how to book page. This is an exciting journey that covers the best of the region and some unusual locations. We’ll begin our journey in lively Bangkok pulsating with life and people before flying to Laos and Luang Prabang; a peaceful city on the Mekong and Nam Khan rivers; and voted one of the most romantic cities on earth. We’ll also visit the stunning jungle waterfalls at Kung Si, – you can even swim here. From Luang Prabang we drive north to Nong Khiew – a beautiful jungle village surrounded by limestone hills on the banks of the River Nam Ou. It’s here we’ll begin our river boat journey, going further north in the direction of China, exploring rural villages on the river’s banks before returning to rudimentary bungalows in Nong Khiew for the night. The following morning is free to relax or explore this beautiful little jungle hamlet – you can also hire bicycles. We return to Luang Prabang for a night before flying to Cambodia and the town of Siem Reap. Here we take you on a full day tour of the magnificent lost city of Angkor in the Cambodian jungle. We’ll do this the ‘Angel’ way by tuk tuk allowing you to spend all day out in the jungle. Leaving Siem Reap, we’ll travel by traditional private boat across Cambodia to the city of Battambang alongside the Sangkae river: we’ll sail across parts of Tonle Sap Lake, the largest lake in SE Asia, and traverse the country’s smaller waterways to witness Cambodian (and Vietnamese) riverside life and floating villages. In Battambang you’ll also experience the famous ‘Bamboo train’ into the jungle. Finally, we’ll stay in Cambodia’s capital Phnom Penh. Once referred to as Indo-China’s ‘Pear of Asia’ on the banks of the Tonle Sap and Mekong river. The chequered history of this city, from French colonisation to the Khmer Rouge regime, gives it both a charming and dilapidated appeal. Lively day and night markets, a riverside setting with promenade; bars, restaurants and some old French architecture makes our stay here fascinating. Our tour here will include the Royal Palace, the infamous S21 Khmer Rouge prison and a poignant visit to the ‘Killing Fields.’ Free time in Phnom Penh is followed by our flight back to Bangkok. The tour price includes all B&B accommodation, 3 internal flights and private transport; guides, entrances, activities and food specified in the itinerary. All you’ll need is some spending money. We hope you decide to join this spectacular tour. Bangkok is 7 hours ahead of the UK which means many flights will arrive the next day. Please see our ‘booking flights’ page for information. We can help you book flights. You may prefer to leave the UK a day or two early to allow more time in Bangkok; for example flying out Friday evening. We can book extra nights’ accommodation for you economically. We always pick you up from the airport whenever you arrive. Arrive in Bangkok airport and you’ll be transferred to your hotel. Rest of day/evening free; depending on what time you arrive. Please note that we may transfer you from the airport to the hotel by Sky Train if this is more convenient (you will be personally escorted all the way to your hotel if this is the case) or by taxi or private car. Bangkok is a lively city – particularly by night and our hotel will be well placed. Today at leisure to explore. We can advise on how best to get most from your time here. Taxis are plentiful and cheap, a river runs though the east of the city providing public boats too. The main tourist attraction is the Royal Palace, but Bangkok is much more than that. Wander around its ‘Super malls’ to see how consumerism has gripped the Far East, visit its lively markets, China town and gigantic weekend market or simply enjoy being in this exciting city and watching daily life. Take a river boat trip (it’s very cheap) to go north to south in the east of the city. Tonight we’d like to host a welcome dinner. Today we will leave Bangkok and fly to Luang Prabang in Laos (around a 2 hour flight). Luang Prabang is a complete contrast to Bangkok. It’s serene, pedestrian friendly and much more slowly paced on the banks of the Mekong and Nam Khan rivers. It was recently voted one of the most romantic cities in the world. Our hotel(s) will be comfortable and nearby the historic centre so that you can walk everywhere. Due to the nature of accommodation in central Luang Prabang we may use more than one hotel/guest house. This morning we drive around 30kms out of the city for our visit to Kung Si waterfalls. One of the most beautiful waterfalls on earth set in the jungle where you can also swim in its natural pools (bring your costume - even if you are unsure, as you may well be tempted). Return to Luang Prabang (approx 1pm) and the rest of the day is free. There are many agencies in the main street offering excursions if you want to keep busy this afternoon. You could take an optional boat ride up the Mekong, hire bicycles to explore – you can also take a local ferry and cycle on the other side of the Mekong to see some traditional countryside. You may wish to explore more of Luang Prabang by foot; it’s beautiful. Today we drive for around 3 to 4 hours northwards to the jungle town of Nong Khiew in its spectacular setting on a jungle river. Our hotels will be rustic but comfortable. We may use more than one set of lodges for our group. From here we board private motorised local boats (we may put car seats in them to make them more comfortable) and take you through a majestic stretch of jungle river to the village of Mung Ngoi. Here, there are simple restaurants if you would like to take lunch - some overlooking the river. After free time we sail further north to visit some small villages on the banks of the river. We return back downstream at sunset to return to our lodges. Nong Khiew is a pretty little simple town, much in the middle of nowhere, with a choice of simple restaurants. This morning you are free to wake up when you want, have breakfast and enjoy this lovely country setting. You may want to hire bikes and cycle to a local ‘history’ cave on the edge of the jungle where people lived during the Vietnam War (bring a torch). You may be able to kayak or go tubing (sitting in truck tyre inner tubes and floating down the river). Please note these activities fall outside of our itinerary so you do so at your own risk. You may prefer to wander around the village or cycle further into the Laos countryside and jungle. This is a lovely place to enjoy splendid views. Around lunchtime we drive back to lovely Luang Prabang for our last evening here (and to be in place to get to the airport tomorrow). Today we transfer to the airport for our flight to Siem Reap in Cambodia. After arrival, check into the hotel and take you on a short stroll to show you where everything is. Siem Reap is a town seemingly devoted to tourism. There are several night and food markets, shopping, bars and restaurants, and an attractive river. Today our local guide will take you for an all day tour of the city of Angkor – one of the most important archaeological sites in Asia containing different remains of the Khmer Empire from the 9th to the 15th century. Lost in the jungle, a visit here is extraordinary. We will drive you around this complex at various sections in the jungle the ‘Angel way’ by convoy of tuk tuks, escorted with our specialist guide. This way you spend all day out in the jungle. Today we leave for our traditional boat trip of around 6 or 7 hours all the way to the French colonial city of Battambang. This will be an unusual adventure. We’ll cross the Tonle Sap Lake (the biggest in SE Asia) before continuing along smaller waterways until we reach Battambang towards the end of the day – please note we will use a private, yet rudimentary local style boat for this journey. We’ll sail past floating villages and jungle towns all the way into Battambang. We may use more than one boat. Later we check into our hotel and the evening is free. Today we take you on a full day tour of the city and surrounds; including Wat Kor village to see its heritage houses and experience a more traditional Cambodia. We will also take you into the jungle to experience a ride of the ‘Bamboo Train’ (this should keep you guessing). Rest of day/evening free. Today we drive by private bus to the capital of Cambodia and check you in to our hotel. Rest of the day/evening free to explore. We can also walk you around to orientate you to this unique city. Our hotel is well placed to walk to most places. There’s a lovely night market near the river for example, where you can experience local foods; the city is very flat and relatively easy to walk. Today we enjoy a guided tour of the area that will include the Royal Palace as well as an exploration into the Khmer Rouge regime visiting the infamous S21 prison and Killing Fields – this will be a moving experience. Today enjoy a completely free day in Phnom Penh. Once known as ‘the pearl of Asia’ and colonised by the French in the 19th century, with a population of two million and markets, remains of French architecture, a long waterfront, restaurants, museums, bars and cafes, as well as friendly people; you’ll enjoy it here. Today we transfer to the airport for our flight back to Bangkok. Tonight enjoy your last night in Bangkok and a farewell dinner. Today we transfer you to the airport for your flight back home. You may arrive the same or next day in the UK depending on which flights you choose.